The original "Arabic" notation for numbers (the symbols or "glyphs" used to represent each digit) may have been invented in South Asia as early as the Bronze Age, possibly by one man (that is, they were not the product of a "group project"). Probably in a later period, Indian mathematicians invented the positional rule, by which each digit's position represents (in the decimal system) a successive power of ten. This rule allowed an extreme efficiency in representing large numbers, and that may be why this "Arabic" notation1 was eventually adopted by the Romans (replacing the Roman Numerals) and by the western world. By the time the original symbols were used and adopted by Hindus and Arabs, they became part of their written languages and were "rounded" by years of use. The symbols would have been adopted in common writing and there would have been no reason to remember why they were invented that way. Here is a possible explanation: Each symbol contained exactly as many angles as the number it represented (The corresponding obtuse "external" angles were not considered). This rule could have been a sort of "verification" (through redundancy) that a symbol, when used, indeed represented the number in question. See figure below. This self-imposed rule still left a lot to the imagination in order to invent symbols that were practical. The symbols had to be different enough not to be confused with each other. The inventor discovered that symbols formed with straight lines are easier to distinguish2. Could this be a coincidence? The first few symbols, especially the "Zero", seem to support the theory. The symbols for "Six" and "Eight" give also a very strong indication that the theory may be correct. Did you ever ask yourself why the traditional symbol for "One" could not be just a single stroke (as in other numeric systems, such as the Chinese or the Roman)? The answer may be: "Because it was the simplest way to represent ONE angle." Observe how the inventor may have chosen to add one angle by closing the bottom part of a "Five" to form a "Six". 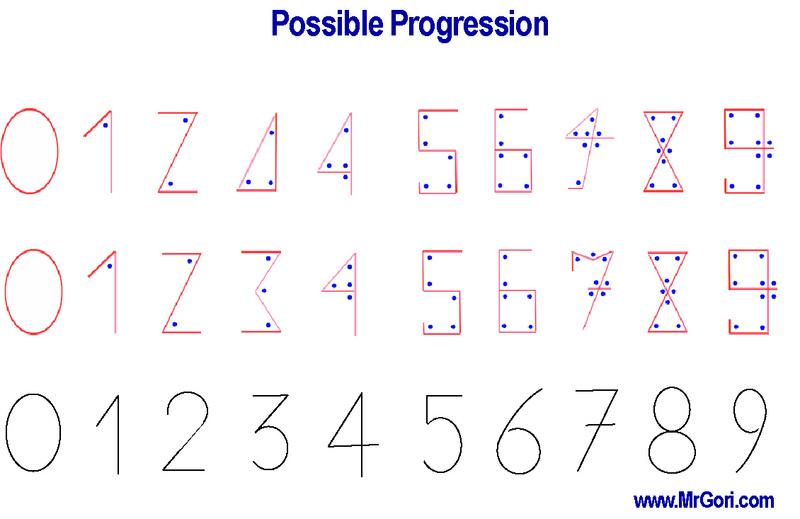 The same "progression" can be observed in creating an extra angle to go from "One" to "Two" and from "Two" to "Three". 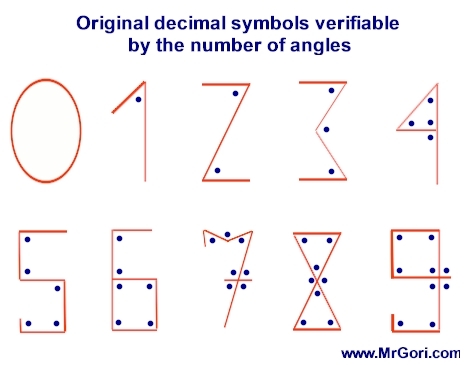 Could the digit "Three" be represented as a triangle, or the digit "Four" by a square? Probably not, because any symbol composed of a single "closed loop" would soon be confused with a "Zero", in normal calligraphy. Why number "Four" is not represented by a cross?3 Perhaps the symbols for "plus" and "minus" had already been in use... or were invented by the same person? Perhaps it WAS a cross, then people found that it could be written more quickly by joining the vertical line with the horizontal line creating a single stroke. This last theory would have a confirmation by looking at number 7, which is a 3 (turned by 90 degrees) plus a 4 (as a cross). How else could you represent "Four"? Perhaps the inventor thought of taking a "One" and add a stroke to form a triangle, thus adding three more angles. Another possibility would be the following: Perhaps number 3 was a triangle, for a while, until people discovered that it could be confused with zero. Once you have a 3 as a triangle, the most obvious progression to 4 would have been to prolong one stroke, adding another angle. How do you represent "Five"? Perhaps keep using segments to form angles in one direction, but avoiding to close the top loop (which would form only four angles), then inverting direction until you have five angles. How do you represent "Seven"? Perhaps as "3+4": You can take a "Three", rotate it, extend one of its legs and use a short cross line to add four angles. All of this seems too much for a coincidence. The inventor made a step from indicating a number by representing the object being counted (e.g. : two apples, three apples...) to a symbol already implied by the stroke of a writing instrument. The simplest could have been the number of strokes: One stroke for 1, two for 2, etc. Indeed this system, as adopted by other civilizations, is feasible, but not very efficient4. As observed before, the relation between a symbol and an actual number of strokes does not need to be explicit (i.e. : any symbol that is sufficiently unique could be used to represent any digit), but the people being introduced to this new notation could have found it useful to have some "verifiable" relationship between the symbol and the number it represented, at least until the majority of people became familiar with the notation. Other stroke-related characteristics could have been used for the symbols: The number of vertices, or straight lines, or curved lines. These ideas may have been found wanting: As the number of such elements increases, the complexity of the symbol increases. On the contrary, it is easy to increase the number of angles. For example, a new intersection between two lines can create four new angles. At the time, anyone thinking about the concept of numbers or geometry would have been a "mathematician". I do not think it would be far fetched to assume that such individual would be aware and think about both geometry (shapes) and algebra (operations with numbers). As we know today, ideas come from people who have experienced two or more fields of knowledge and establish a relation between them. Thus our inventor would have been familiar, for example, with triangles. He would have been aware of the "triangle" shape, the "angle" concept and would know how many angles are in a triangle (without considering the "external" angles). When looking for symbolic characters for numbers, regular geometric shapes with angles would have been the first thought on his mind. However, for the reasons mentioned above, simple regular shapes had to be discarded in favour of other unique shapes with angles. When looking for new symbols, the inventor would probably have maintained the awareness of the number of angles created by different shapes. This is not the only "Arabic" notation. Other notations are used in the Middle East and Asia. For example the "MICR" fonts used today at the bottom of bank cheques, which need to be "recognized" by a machine, are all "stick" symbols (they contain no curved lines) for the same reason (ease of pattern recognition). Other examples include numbers represented in low definition Digital Panel Monitors, characters in low-definition electronic boards and digital counters in electronic equipment. (3) Number "Four" is represented with a symbol similar to a cross, forming four angles, in other Asian languages, e.g. : Persian, Devanagari, Gujarati, Gurmukhi, Oriya, Telugu, Malayalam. (4) After the simple strokes for One (I), Two (II) and Three (III), both Roman numerals and Chinese numerals switch to a (more complex) symbolic notation.